Fairwater, developed by Frasers Property, is the largest geothermal community in the southern hemisphere. These days there’s a lot of talk about “sustainable” daily-living practices and “sustainable” business practices. But let’s be honest: some practices are more sustainable than others. One monitoring organization that sets a high bar is the Green Building Council of Australia (GBCA). Clarissa Sebag-Montefiore wrote recently at the Guardian about projects the council has approved: “In 2016, a new master-planned estate in [Blacktown, near Sydney] became the first residential community in New South Wales to be awarded a top, six-star Green Star community rating by the Green Building Council of Australia. “Not only that, Fairwater, developed by Frasers Property, is the largest geothermal community in the southern hemisphere. Houses are cooled or heated by a refrigerant that pumps air underground then back to the surface, using less power than air-conditioning or heating and saving residents of a three-bedroom house $500 to $600 a year. “Green-star buildings produce, on average, 62% fewer greenhouse gas emissions and use 51% less potable water and 66% less electricity than average buildings in Australia, according to GBCA’s 2013 report The Value of the Green Star. “Developers, ultimately, ‘are there to sell house and land packages – so they’re not going to be successful unless they’re building something people want to buy. Take “sustainability” out and ask what [buyers] want. They want something close to amenities – schools, public transport, shops and parks. And a home that is cheap to run.’ ” Read about other sustainable projects in Australia here. Hat tip to ArtsJournal.com, a great source of stories. 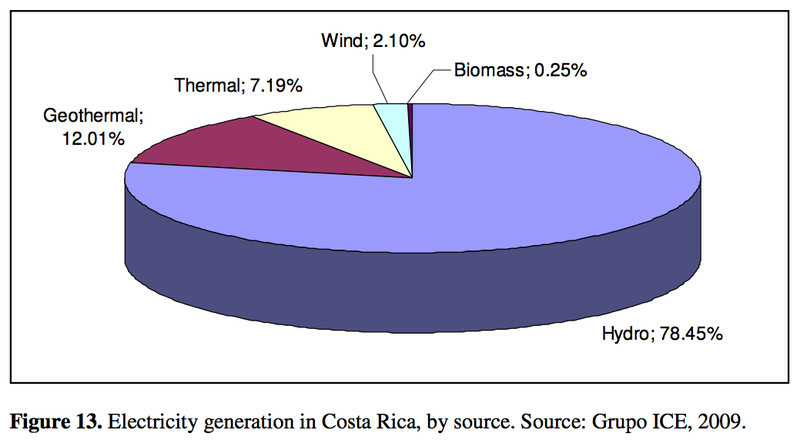 In September, Victoria Lynden tweeted about Costa Rica’s clean electricity. Although hydroelectric and geothermal approaches sometimes have issues of their own and cars in Costa Rica still use gas, two months without using fossil fuels to generate electricity sounded pretty good to me. Brad Plumer wrote at Vox, “Costa Rica is pulling off a feat most countries just daydream about: For two straight months, the Central American country hasn’t burned any fossil fuels to generate electricity. That’s right: 100 percent renewable power. “This isn’t a blip, either. For 300 total days last year and 150 days so far [in 2016], Costa Rica’s electricity has come entirely from renewable sources, mostly hydropower and geothermal. Heavy rains have helped four big hydroelectric dams run above their usual capacity, letting the country turn off its diesel generators. “Now, there’s a huge, huge caveat here: Costa Rica hasn’t eschewed all fossil fuels entirely. The country still has more than 1 million cars running on old-fashioned gasoline, which is why imported oil still supplies over half its total energy needs. The country also has cement plants that burn coal. “What Costa Rica’s doing is nevertheless impressive — and a reflection of how serious the tiny Central American country is about going green. At the same time, a closer look at the story shows just how difficult it would be for other countries to pull off something similar. “So if Costa Rica can get 100 percent of its electricity from renewable sources, why couldn’t other countries do the same? Why can’t the United States, which is far richer? “One obstacle here is that hydropower and geothermal are very location-specific — and only a few countries are lucky enough to have such rich resources. Iceland gets nearly 100 percent of its electricity from these two sources. Paraguay gets almost all of its electricity from the massive Itaipú Dam. Brazil gets more than 75 percent of its power from hydropower. But those are exceptions. For most countries, hydropower can only satisfy a portion of their power needs.” Read on. Seems to me that when a country wants to be greener (whether for the environment or to save money or both), it has already taken the first step to finding solutions that work for its own geography.